The chefs who cook for the world's leaders usually keep a low profile, leaving the limelight to their bosses. But once a year, it is their turn to be wined and dined and treated as honoured guests in a foreign country. Billed as the world's most exclusive gastronomic society, the Club des Chefs des Chefs brings together the men and women who cook for heads of state to exchange ideas and — presumably — insider information on their bosses' tastes. “The presidents all met each other. 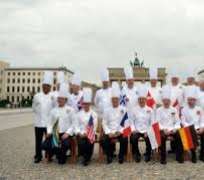 I thought it was a good idea to make a sort of G20 of the chefs,” the club's founder Gilles Bragard told journalists in Delhi. Rather than subjecting the chefs to Delhi street food, he has had the kitchen of their five-star hotel recreate golgappas and aloo tikkis — popular fried snacks made of wheat flour and potato and served with sweet and spicy chutneys. “I can't take them to the street because they are foreigners. Their tummies are too sensitive,” said Saini. “This is fantastic,” said Bernard Vaussion, who cooked for six French presidents before he retired, as he pushed his way through the market's packed alleyways. India takes its toll though. By day three, one of the visiting chefs has fallen ill, while another is feeling the effects of Indian cuisine. Like most of the visiting chefs — 16 men and one woman, America's Cristeta Comerford — Boca is eager to learn more about India's vast range of spices. “It's not a recipe driven food, it's more of a philosophy,” she told AFP. They also have a hotline known as the “blue telephone” that allows them to consult each other on their bosses' preferences before a state visit. “Looking for more sustainable more local produce has become more prominent,” said Mark Flanagan, chef to Britain's Queen Elizabeth. Given the move towards lighter dishes, it was perhaps doubtful whether the first recipe they tried on arriving in Delhi — the heart-stoppingly calorific Indian sweets known as jalebis, made of deep-fried batter soaked in syrup — would be recreated at home. But Christian Garcia, the club's current president and personal chef to Prince Albert of Monaco, said he might be tempted to ask for the recipe. Princess Charlene, he said, was a big fan of Indian cuisine. “I thought I knew how to cook Indian food a bit, but now I realise I was completely wrong,” he said.